After Further Review, Having Regular Refs Back Made It 'A Real NFL Game' : The Two-Way It was clear Thursday night that the return of the league's officials after their labor dispute restored order. In Baltimore, fans made their feelings clear Thursday night. 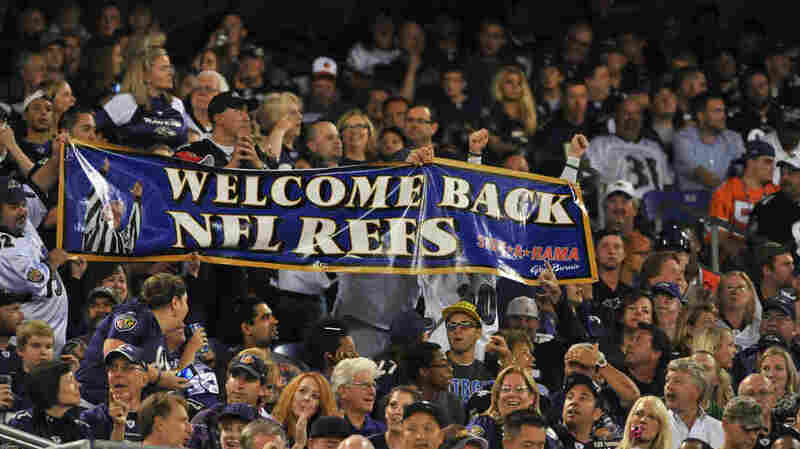 Friday morning quarterbacks seem to be unanimous in saying that having a "regular" crew of officials back on the field for Thursday night's NFL game between the Baltimore Ravens and Cleveland Browns made an immediate — and positive — difference. "It felt like a real NFL game because the real NFL refs were back," writes ESPN's Jamison Hensley. The most noticeable moment when having real refs on the field made a big difference, according to USA Today's Robert Klemko, came in the first quarter when the Browns' Josh Cribbs was leveled by a devasting (and legal) hit. As Cribbs lay on the field, "one shove after the whistle led to another shove and a couple more, then Baltimore's James Ihedigbo and Cleveland's Johnson Bademosi took it from a tiff to a scuffle," Klemko writes. But "head referee Gene Steratore's crew of comparatively tiny men rushed to put an end to it." Had the "replacement refs" who filled in during the lockout that prevented experienced crews from officiating during the first three weeks of the season been on the field, there likely would have been a full-blown flight. "In each of the Ravens' previous three games this season, tiffs became scuffles, and dozens of times, scuffles became fights," Klemko writes. "If you watched an NFL game last week, it's not hard to imagine Cribbs lying prone while a dozen or more unknowing athletes jostled inches from his bare head." Ironically, the game ended in a way reminiscent of the Monday night debacle that put intense pressure on the league and the officials to settle their differences. But unlike on Monday, when replacement refs blew the call and gave the Seattle Seahawks a win over the Green Bay Packers, last night the "hail Mary" pass thrown into the end zone by Cleveland did not produce any disputed call. True, "the referees didn't have to make any key call because the throw sailed out of the back of the end zone," as ESPN's Hensley says. But it was also clear throughout the game, he writes, that "the officials restored order." One more note: The officials' importance to the game was underscored by the greeting they got from the Baltimore crowd. They were cheered! As the Baltimore Sun writes, "instead of receiving the usual jeers that go with their profession, NFL referee Gene Steratore and his crew were treated like conquering heroes Thursday night at M&T Bank Stadium." Afterward, the Sun reports, "Steratore said it was a special game for him and his crew after the NFL officially ended the lockout of the regular officials." "The emotional kind of overtook all of us for a second there," he said, according to the Sun. "We know what this is. We know how special this, and we have always taken such pleasure in being a part of this whole thing and having it go smoothly without being recognized. When you're actually recognized, it was a little different feeling. So, you have a moment."